Mmmmm, crepes for breakfast. My grandmother used to make crepes for me. I would drop some jam in them, roll them up, and eat them with my hands. I know, I’m such a savage! I have never had much skill in getting that crepe batter to spread properly. Lo! Then I married a man who can! No, no…I didn’t just marry him for crepe making ability. It’s definitely a big winner though. I did marry a man who is a foodie too though…and simple jam just won’t do all the time. The results can be a lot of fun. Expect to see a good deal of crepes here. Especially since my husband has found a low fat and low calorie batter he likes, the secret? Egg whites…no yolks in this batter and he cut down the flour needed. I can’t even tell they are missing! Can you? They are stuffed with a light chocolate mousse, just a mix from Dr. Oetker that we added sugarfree almond rocca torani syrup to. Then topped with a dollop of fat free cool whip and slices of lightly toasted slivered almonds. Each one of these fluffy delights was only 102 calories. So simple to make, so pretty and tasty! Total for the breakfast before you is 306 calories. Can I get a wahoo? It certainly eats the heart out of those little 100 calorie snackie cake things I’ve seen in the supermarkets. At the end of breakfast I was one full girl! I actually found this carried me right into lunch, no need for a morning snack. Breakfast definitely was the most important meal that day! And really, who doesn’t love the idea of chocolate for breakfast? 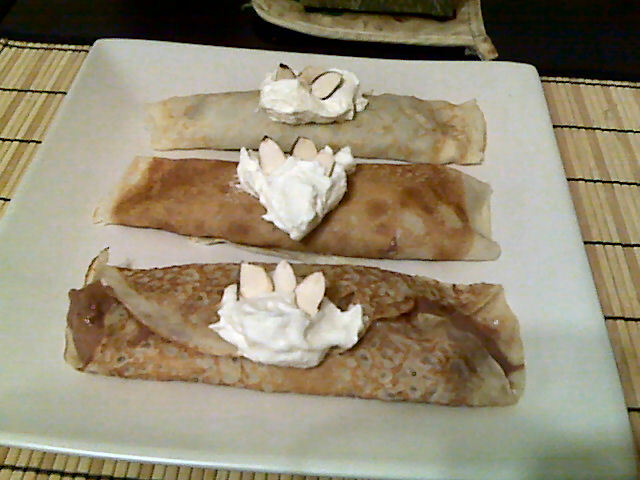 This entry was posted in Breakfast and tagged almond, chocolate, crepe. Bookmark the permalink.